In spring and summer of 2010, plants in some tomato and pepper fields in coastal California have developed virus-like symptoms. Affected plants were found in both Monterey and San Benito counties, though disease incidence was low. Samples submitted to the Gilbertson lab at UC Davis tested positive for the curly top virus, indicating that these symptoms were due to curly top disease. Curly top can be a severe disease for both tomato and pepper. Symptoms of the disease vary depending on the host plant infected and the stage of growth when infections occur. In general, affected plants show some degree of stunted and distorted growth and leaf curling and light green to yellow discoloration. In tomato, curly top symptoms begin with leaves showing light green coloration, up-curling, and vein purpling on the underside of leaves. Plants become stunted with twisted, distorted, and yellow leaves. Plants infected at an early stage of development stop growing and die, often standing out among nearby healthy plants. 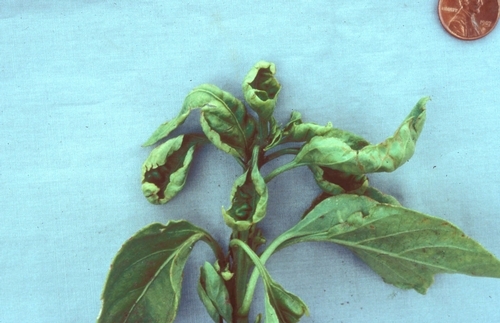 Plants infected at later stages of development show distorted growth and light green-yellow leaves with vein purpling; these symptoms will develop on the upper part of the plant or on entire shoots, but the plants generally do not die. Any fruits produced will be stunted and ripen prematurely. 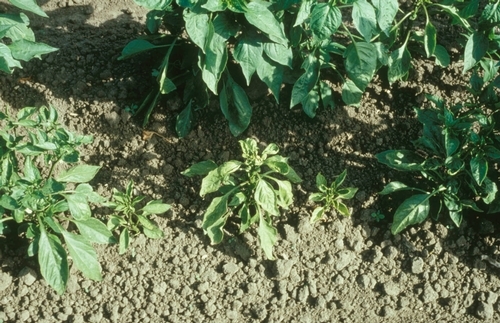 In peppers, plants are stunted with shortened internodes. Leaves are light green or yellow in color, show strong up-curling, and are thick and brittle. Plants infected at a young stage of growth may die, whereas older plants are stunted and leaves again curl upwards and are light green to yellow; any fruits that develop are small, wrinkled, and unmarketable. As for all diseases caused by viruses, confirmation of curly top disease requires laboratory testing because other tomato and pepper viruses can cause symptoms that are similar to those caused by the curly top viruses (e.g., symptoms caused by Tomato spotted wilt virus). In California curly top disease affects many plants including tomato, pepper, bean, pumpkin, squash, spinach, sugar beet, other crops, and many weeds. Researchers have discovered that curly top disease in the western USA is actually caused by several distinct virus species. Therefore, curly top of tomato or pepper could be caused by one or more of the following viruses: Beet curly top virus (BCTV), Beet mild curly top virus (BMCTV), Beet severe curly top virus (BSCTV). For example, samples in 2008 from Monterey County tested positive for either BMCTV or BSCTV. The curly top viruses are vectored by the beet leafhopper (Circulifer tenellus). The virus is not carried in seeds nor is it mechanically transmitted (i.e., by touch or physical contact). Disease incidence and distribution in tomato and pepper fields in a given year are dependent on the populations of the beet leafhopper and the migratory feeding patterns of this insect. Most infections tend to occur early in the growing season, but late season infections may also occur, as in 2010. In general, for coastal California, disease incidence is usually low and symptomatic plants occur randomly in a field, indicating where the fast moving leafhopper has stopped to feed. The random, scattered distribution of diseased plants reflects the fact that tomato and pepper are not preferred hosts of the beet leafhopper and that the insects move on in search of preferred hosts, such as plants in the beet family (Chenopodiaceae). 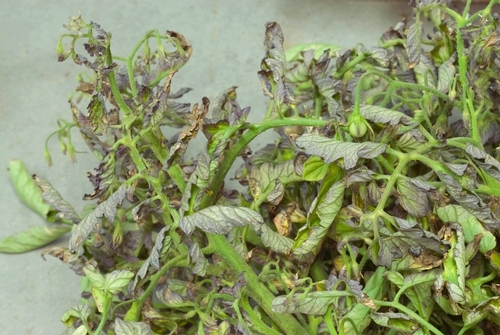 Tomato infected with curly top viruses: If infected early, plants can be severely stunted. 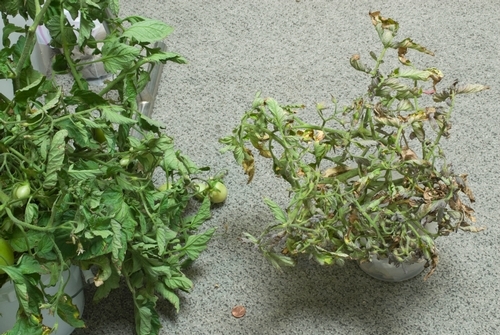 Tomato infected with curly top viruses: Leaves can be thickened, deformed, yellowed, and rolled upwards. Symptomatic tomato leaves often develop purple veins. Pepper infected with curly top viruses: If infected early, plants can be severely stunted. Pepper infected with curly top viruses: Leaves can be thickened, deformed, and rolled upwards.